Home » Basketball » State of the Knicks- Playoffs? State of the Knicks- Playoffs? The Knicks have defied all odds and have played really great thus far this season. If the season ended today, they would be the #5 seed in the East, obviously the season does not end today, but this early start is laying foundation for the future. The Knicks have a true superstar in Kristaps Porzingis, and the remaining pieces to form a good basketball team are not far behind. The Knicks are still little far from greatness, but it is in sight now. The Knicks only lost one game this week, but won every game that they should have won. If the Knicks want to make the Playoffs, then you have to win majority of your home games and beat up on bad opponents away from home. The Knicks did not have a road game since the last blog, but went 3-1 in games at home and are now two games over .500. The bottom four seeds of the East are going to roam right around .500 it seems like, so if the Knicks just win half of their remaining 72 games this season, they should be in contention for a playoff berth. The Knicks do not have a road game till NEXT FRIDAY, so this week they should win atleast two of the three games, but will have a chance to win all three. They play the Magic, the Kings, and the Cavs this week, all games that are winnable based on how the teams have played in this young season. The Magic are in the same boat as the Knicks, in that they are trying to build for the future, the Knicks should be able to handle them at home, thanks to their hot offense. The Kings are in deep rebuild and have a young roster that will be overwhelmed by the loud crowd of Madison Square Garden on a Saturday night giving the Knicks an opportunity for an easy win. The Cavs are not as good as we thought they were, they have a lot of issues and beating the Knicks in a prime time game will take some pressure of the Cavs players, but the Knicks already blew them out in Cleveland this season, so they might go into the game as the odds-on favorite. The Knicks have gotten of to this great start thanks to their offense, especially Porzingis, who is an early season MVP candidate. The team is scoring around 105 points every game, while Porzingis is averaging 30 points per game this season. He is scoring his points easily and can score more depending on how the game is going. Porzingis continues to elevate his status as a NBA Superstar and he is taking the Knicks closer to the promise land. The Knicks have finally gotten contributions from Frank Ntilikina, who is turning into a really good second option for the Knicks behind Porzingis. 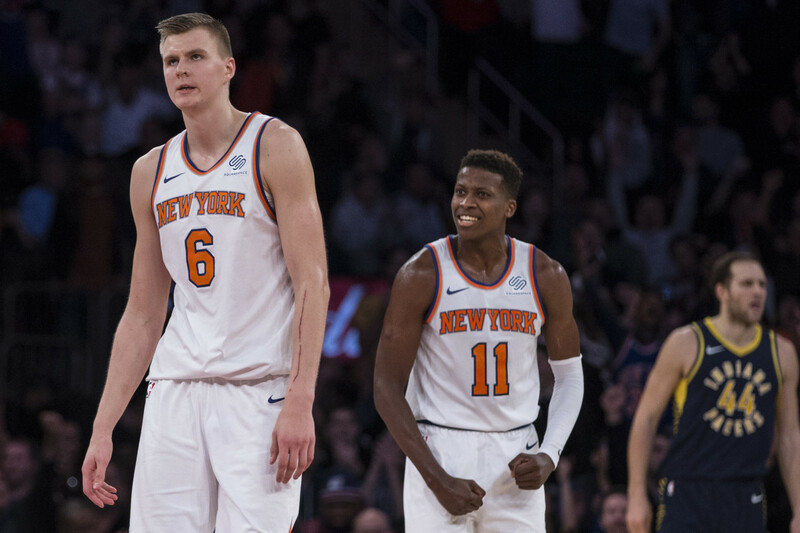 If both players keep progressing the way they are right now, then the Knicks have the opportunity to have one of the best offensive forces in the NBA in a few years. The defense needs to get better for the Knicks, they have given up at least 100 points in each of their last five games, but the offense has bailed them out in four of those games. At some point, Porzingis is going to have a bad offensive night, so the defense has to get better and start bailing out the offense on some nights. The defense is the only reason, I am not fully on board the Knicks bandwagon, if they figure out their defensive woes, then the Playoffs are for sure a realistic possibility. I think the Knicks will win two of their three games to keep up their great start and get the Garden roaring even more. It is just so much better for the city of New York and the NBA as a whole, when the Knicks are good and the fans go to the Garden to cheer on them instead of corporate snoozing.